A black and white negative of a portrait of Mr. Samuel Brush. Mr. Samuel Edward Brush was born at Toronto, Ontario on December 19, 1921 and moved to Whitby circa 1958. He worked for Nutri-Products Ltd. in Whitby and later was a custodian at Henry Street High School. He was President of the Royal Canadian Legion Branch 112 in 1967. Mr. Brush died at Oshawa on July 26, 1997 and is buried in St. John's Roman Catholic Cemetery, Whitby. 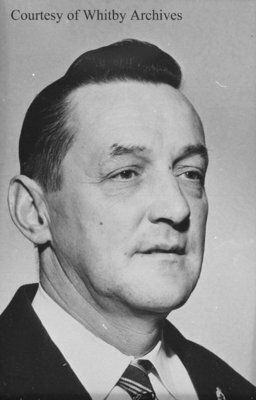 Samuel Edward Brush, 1967, Photographer Unknown. Whitby Archives A2016_017_039A.